Borrelia Hermsii is a bacterium that causes most cases of Tick-borne Relapsing Fever (TBRF). Borrelia burgdoferi and Borrelia hermsii are classified in the same genus but are very different. 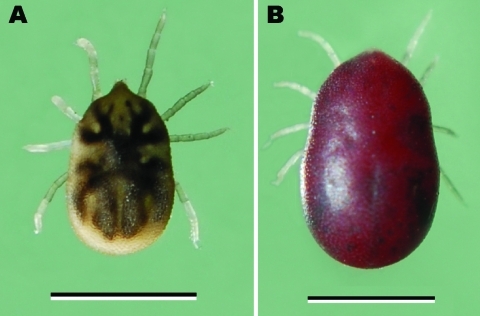 For example, they are spread by different ticks in generally different geographic areas. A literature search performed in May 2018 did not reveal any known co-infections of Borrelia hermsii. Tick-infested cabins are a frequent source of Borrelia Hermsii infections. Typically, a patient will experience fevers for 3-5 days, followed by 5-7 days of supposed recovery, followed by a relapsing fever. According to the CDC, this infection is typically cured with 2 weeks or less of antibiotic treatment. A CDC report of Tick-borne Relapsing Fever cases from 1990-2011 showed a median 20 confirmed cases per year in the United States. Borrelia hermsii is transmitted to humans from the bite of soft-bodied Ornithodoros hermsi ticks. There is no compelling evidence Borrelia hermsii is transmitted by the same tick as Borrelia burgdorferi, Babesia microti, Anaplasma phagocytophilum, Ehrlichia. There is also no compelling evidence soft-bodied Ornithodoros hermsi ticks cause any tick-borne disease other than Relapsing Fever. TBRF cases are reported most commonly in US 14 states: Arizona, California, Colorado, Idaho, Kansas, Montana, Nevada, New Mexico, Oklahoma, Oregon, Texas, Utah, Washington, and Wyoming. In Canada, TBRF is considered a highly unusual infection, but cases are generally constrained to southern British Columbia. In 2015, 14 US states reported ~95% of Lyme disease cases: Connecticut, Delaware, Maine, Maryland, Massachusetts, Minnesota, New Hampshire, New Jersey, New York, Pennsylvania, Rhode Island, Vermont, Virginia, Wisconsin. Lyme disease cases are extremely rare in British Columbia (where rare cases of TBRF are acquired), with 5 cases each year reported contracted there on average during the 12 year period between 1997 and 2008. As is quite clear from the maps, Lyme disease is usually transmitted in quite different areas from TBRF. Ornithodoros hermsi nymphal tick from Mt. Wilson, California, USA. Schwan TG, et al. Diversity and distribution of Borrelia hermsii. Emerging Infect Dis. 2007;13(3):436-42.